Former Manchester United and England midfielder Paul Scholes has left his role as Oldham boss after just 31 days. The 44-year-old took on his first managerial job on 11 February and was only in charge of the League Two club for seven games, winning one. Scholes said in a statement that he had decided to resign with "great regret". "It unfortunately became clear that I would not be able to operate as I intended and was led to believe prior to taking on the role," he continued. Scholes took over with the Latics 14th in the table, nine points off the play-offs, and leaves with them in the same position. He began his reign with a 4-1 win over Yeovil Town, but three draws and two defeats followed prior to his final match, a 2-0 defeat by league leaders Lincoln City on Tuesday. "I hoped to, at the very least, see out my initial term of 18 months as the manager of a club I've supported all my life," he said. "The fans, players, my friends and family all knew how proud and excited I was to take this role. "I wish the fans, the players and the staff - who have been tremendous - all the best for the rest of the season and will continue to watch and support the club as a fan." He initially announced his retirement at the end of the 2010-11 season, but made a comeback at the start of 2012 before finally calling time on his career in 2013, having won 11 Premier League titles, three FA Cups, two League Cups, five Community Shields and two Champions Leagues. Scholes resigned as a director of National League side Salford upon taking over at Boundary Park, but he retained his shareholding and could now return. Salford could be promoted to League Two this season and EFL rules prevent a person holding roles with two clubs at the same time without prior consent, although a holding of 10% or less in a club is disregarded providing it is held "purely for investment purposes". Moroccan football agent Abdallah Lemsagam became Oldham owner in January 2018 and is now looking for his fifth manager, although Scholes' predecessor Pete Wild was only in charge in a caretaker capacity. 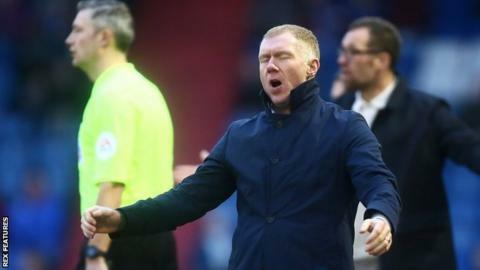 A club statement said: "Oldham Athletic Football Club can confirm that Paul Scholes has resigned from his position as first-team manager with immediate effect. There were plenty, privately as well as publicly, who told Scholes that cutting his managerial teeth at Oldham was a bad idea. But, such was his long-held desire to manage his hometown club, he ignored them all. As he has proved so regularly as a pundit, Scholes is a straight talker. He is also decisive. It was always the case he would resist any outside interference, which is a claim that has been levelled at Oldham owner Abdallah Lemsagam on more than one occasion, and in the end, the former Manchester United midfielder's status became untenable. To many, it will not come as a surprise. To others, there will be a sense of satisfaction given how brutal Scholes has been at dishing out criticism from the comfort of the pundit's chair. Yet there is sadness too - sadness that Scholes couldn't make his dream job work, and sadness that one of those most gifted players of his generation should find himself on the outside again when surely, there is a role for him inside.